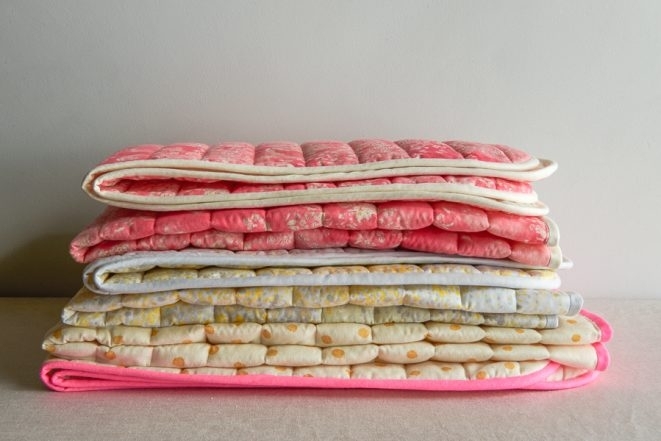 Nani Iro’s Quilted Double Gauze has a lot going for it: the prints are stunning, the colors are luminous, the fabric is super soft… and it’s pre-quilted! 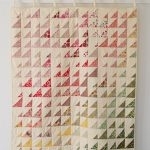 This all adds up to what is basically a gorgeous ready-made quilt. Just add binding and you’re good to go! 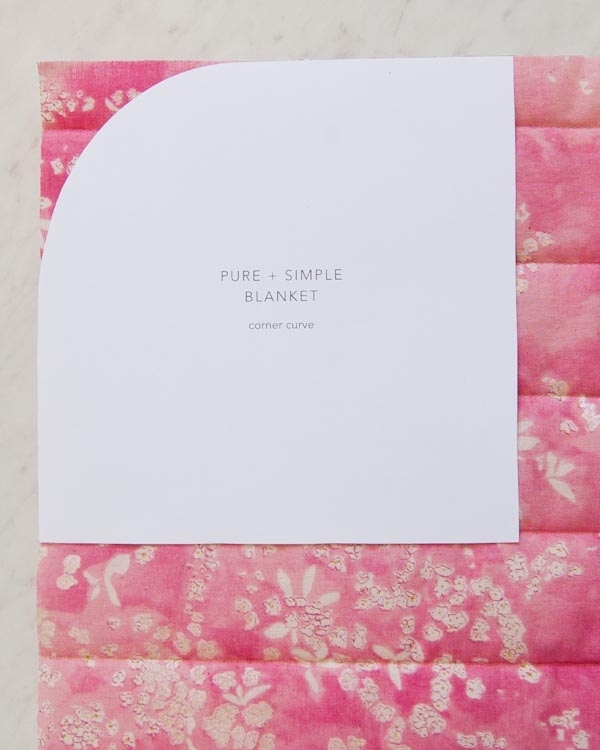 As the name implies, our Pure + Simple Quilted Blanket keeps it simple. With just a few cuts and some pre-made binding, you get a soft, cozy, and absolutely stunning blanket. P.S. This project was inspired by our Pure + Simple Wool Blankets. 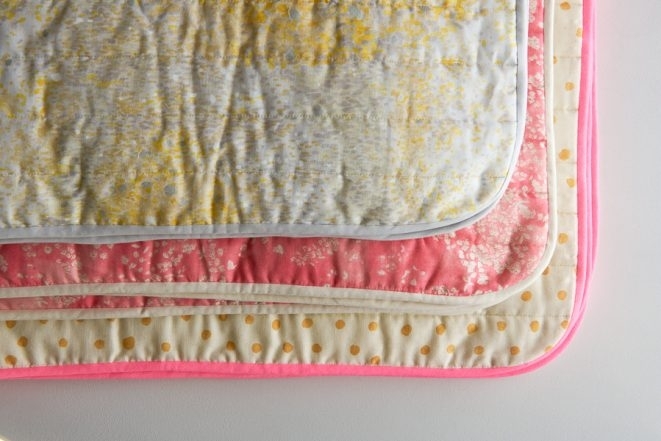 This original project includes more size options and uses a non-quilted fabric. 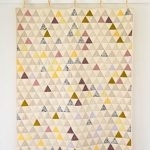 NOTE: You can always pre-quilt some fabric yourself, or use a single layer of a two-sided fabric. That’s what we did for our Pure + Simple Wool Blankets! 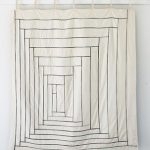 Use a rotary cutter to cut the fabric into a 40 x 50-inch rectangle. Lay one corner of the fabric out flat. Place the Template on top of the fabric as close to the corner as you can while keeping the straight edges of the Template flush with the cut sides of the fabric. Cut the fabric around the curve of the Template. Bind the Blanket’s edges with the bias tape. Can’t open the page for the pdf download, I’ve tried on 2 different computers and on chrome and on explorer. Sorry about that. This issue has been fixed but thank you for letting us know! This issue has been fixed, thank you so much for getting in touch about it! A twin sized quilt is usually around 65 X 85″. Tt=his particular fabric won’t really work since you’d have to piece it together and there isn’t a very clean way to do that since it’s pre quilted. But if you have fabric that is at least 65 inches wide you would need 2.5 yards of the fabric and 9 yards of bias tape. So beautiful. Can you machine wash the blanket? I am mostly concerned with the binding coming off. Yes, you can machine wash it. The binding won’t fall off! 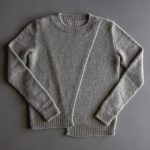 What color blanket, bias tape, and thread combinations would you recommend for boys? Pocho in Ecru/White with Silver bias tape and 9045 thread. Pocho in Gray/White with Silver bias tape and 9045 thread. Pocho in Gray/Gold with Slate bias tape and 7410 thread. Pocho in Ecru/Gold with Natural bias tape and 1040 thread. Birds Eye in Shinsei Blue/Violet with either Baby Blue or Slate bias tape and 7528 or 7410 thread. Now THIS is a brilliant idea. 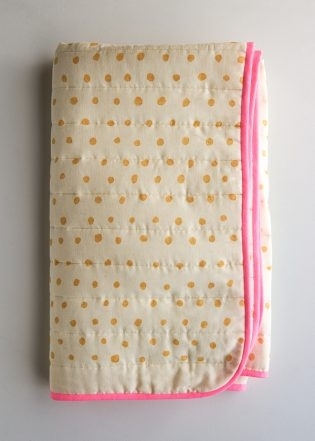 Hi wondering if I can get by with a yard to make a baby blanket/play mat? Thank you for the question! I think a yard would do fine for a baby blanket/play mat. Best of luck! 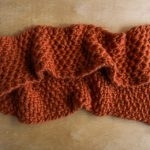 I would love to make this in the Blue/Violet color. Which color of Bias tape goes best, the baby blue or the denim? It’s hard to tell on the computer monitor. Thanks for writing in! Looking at the fabric and bias tape in the shop, I think that the denim goes very well with the lovely blue/violet Nani Iro! Teresa could buy two of matching pre-quilted fabric, cut it in squares, assemble the squares and sew the binding. Would be even more eye catching! Is it hard to keep the binding from bunching up as you round the corners? It’s not actually it goes around the corners quite smoothly. Thank you for this lovely pattern! 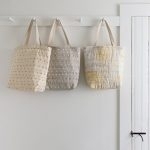 Do you need to prewash the Nani Iro before sewing on the binding? No, you do not pre-wash the fabric in this case. Thanks for your question! Will yall be getting in any more of the bugeon pink in? Thanks for writing in! We will not be getting more of this color in at this time. 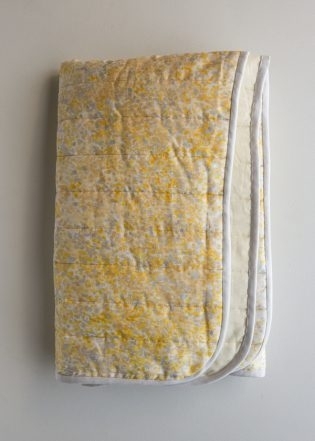 Love this idea of a double gauze blanket. I’ve never seen double gauze. It looks like it has a little padding in betthe layers? Thanks for writing in! You are correct! This is a special fabric! It is a prequilted double gauze. That is to say that it is a layer of double gauze, a layer of batting and another layer of fabric that have already been quilted together. This saves you the time of quilting it yourself! I’m not finding the quilted double gauze in your shop. do you guys still carry this or do I have to go through another distributor? Thanks for writing in! We no longer stock the pre-quilted fabric used in this pattern. 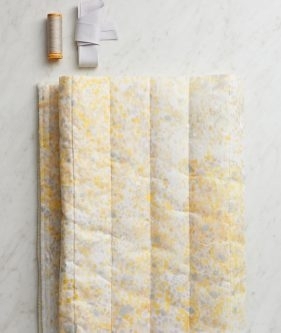 We do however, carry double gauze that you could quilt using batting and a plain colored double gauze for the backing. 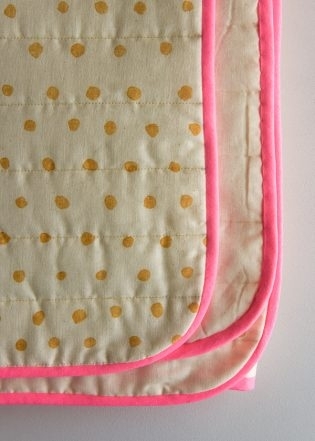 I use a saucer or a plate as a template to cut the corners off my material when making a blanket. It makes using a rotary cutter easier than marking & cutting with a pair of scissors. Thanks for writing in! 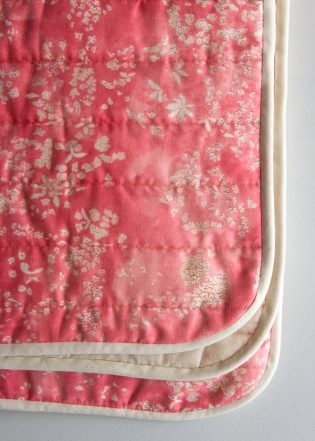 This lovely fabric comes pre-quilted from the manufacturer so I am unable to tell you what loft was used. It is a polyester batting and looks to be between 1/2 and 3/4 inch thick. 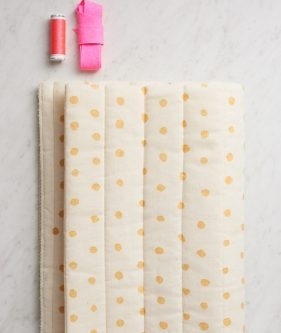 Can you recommend the items that I would need that would coordinate with the Nani Iro Birdseye Yellow/Green. Thanks for writing in! To match Nani Iro Birdseye Yellow/Green, I would suggest using Bias Tape by the Yard in Citrus with Gutermann 1600 or 1620 sewing thread! Unable to see the quilted fabric only refers to unquilted when buy this fabric button pushed. Thanks for writing in! We no longer carry the pre-quilted fabric but you can certainly quilt your own own fabric using batting and some muslin for the backing! Will you have back the last season gold dot fabric ? Thank you for writing us! Unfortunately we no longer stock the pre-quilted fabric used in this pattern. 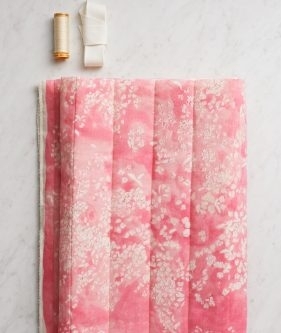 We do however, carry double gauze that you could quilt using batting and a plain colored double gauze for the backing. The patterns are seasonal so once they sell out they are gone. Thanks for reaching out! Unfortunately we no longer stock the pre-quilted fabric used in this pattern. 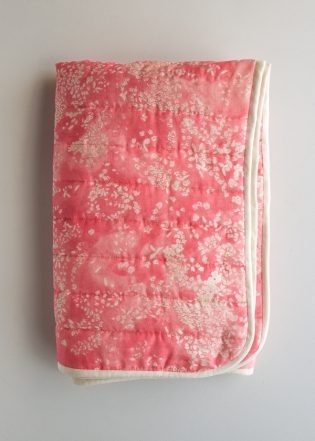 We do however, carry double gauze that you could quilt using batting and a plain colored double gauze for the backing, but all of Nani Iro’s prints are seasonal and the fabrics used in the sample have sold out. I’m sorry about that! Best of luck and happy sewing! Thank you for reaching out! Unfortunately this quilted fabric is Seasonal and we are sold out. 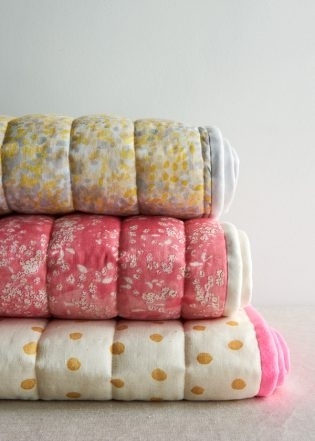 The current line of Nani Iro fabrics do not have the pre quilted option. Why do you post instructions in pale print? Thank you for writing and for you great feedback- I will certainly pass it along!